Lamon Reccord led protesters through an awards ceremony where Lori E. Lightfoot, president of the Chicago Police Board, was being honored. CHICAGO — Protesters crashed an awards gala Thursday night hosted by the Black Women’s Expo to object to one of the group's award recipients, Chicago Police Board President Lori Lightfoot. Protesters led by activist Lamon Reccord marched into the Crystal Ballroom of the Hyatt Regency Chicago, 151 E. Upper Wacker Drive, where Lightfoot was receiving the Woman of Valor award as part of the Black Women’s Expo’s Phenomenal Woman Awards gala. “Police officers are not being held accountable, elected officials are not being transparent with community members,” Reccord shouted through a megaphone while marching around dinner tables. Attendees had just been served their salads when shouting erupted from the back of the room. 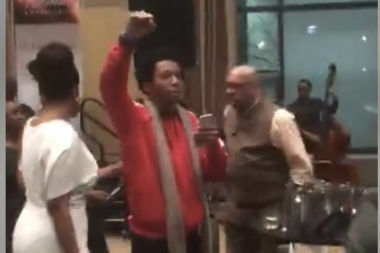 The protesters' reason for interrupting the event was to send a message to attendees that Lightfoot's job performance did not warrant celebration. “You’re honoring the wrong woman,” Reccord kept repeating as event organizers tried to usher him from the room. Once in the lobby, security blocked the doors so the group couldn’t return. Reccord and other protesters continued chanting in the lobby. After that, the group peacefully left the hotel. Reccord expanded on the rationale behind the protest Friday morning. "The message we wanted to send was that Lori Lightfoot is not a phenomenal woman and she needs to be held accountable for her actions," Reccord told DNAinfo. "She support[s] officers who are gunning down young black African-Americans, and we as community residents will not accept it. She needs to resign right now along with the mayor of Chicago, Rahm Emanuel." Lightfoot briefly acknowledged the interruption while thanking the hosts for honoring her. “I stand here today, particularly with the special attention I received earlier tonight, because I am a product of a mother and father who didn’t have much, but offered me love and told me that no matter what, I had to hold my head up high to set my goals and to not let anyone try to silence my voice, and I never have and I never will,” she said. Kids Off The Block; fashion designer Barbara Bates of the Barbara Bates Foundation; and Toi Salter of Salter Financial Management. U.S. Rep. Maxine Waters (D-Calif.) was the keynote speaker. This week marks the 23rd annual Black Women’s Expo in Chicago, which starts Friday and runs through Sunday at McCormick Place. The events offers informative seminars and panel discussions presented by local and national speakers and lecturers, educational exhibits, corporate displays and entertainment. Tickets for The Black Women’s Expo can be purchased online at www.theblackwomensexpo.com.